Having spent a week on Richmond 9 with the following crew: Mahmut Turan (Seaman), Nuri Ardic (Captain), Okan Yalcin (Chef) from 10th - 17th September, 2011 we wish to confirm that all three members went out of their way to make our holiday one of the most memorable. The food was excellent, and all in all nothing was too much trouble. The captains timing and sailing skills were of a very high standard, and all three worked extremely well as a team! Language presented no problem at all, and their interaction with us went far beyond the normal 'call' of duty. Their hospitality made us feel like we were part of their 'family'. We have no hesitation in recommending them to any company who would require their skills. We will surely miss them when we return to South Africa, and we wish all three of them, the best for the future. Welcome on board of M/S RICHMOND 9, the former M/S ADMIRA, a gulet pecialized for the Mavi Yolculuk, as we say for Blue Cruise in Turkish. Cozy and comfortable, very stylish. Excellent performance under sail. Home ported and constructed in Bodrum, she is a typical wooden ketch and available for weekly or longer cruising periods. Up to10 persons accommodation capacity in 5 air conditioned cabins. Please check the below technical datas. 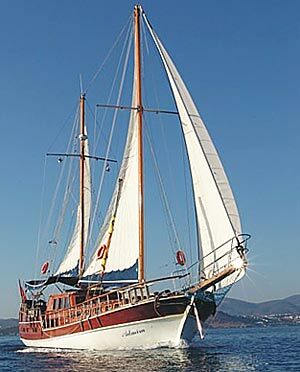 Under the name M/S ADMIRA she also sailed many times the Bodrum Cup and won first prizes in her category. This Gulet easily accomodates up to 10 guests in 1 large master-cabin and 4 cabins with double beds, each with private bathroom. The spacious salon is completed with colour TV and stereo system for CD's. Playing cards and a backgammon set are also on board. The boat is a Turkish flagged Ketch Gulet, and had formerly a German/Dutch couple as owners. They looked very well after the boat and kept her in good shape. The gullet M/S RICHMOND 9 will visit magical ancient sites and coves and you will get to know the most popular bathing resorts and harbour cities. If you want, you can wander through famous archeological sites or use snorkeling equipment to discover sunken harbour moles. is considered to be among the finest in the world. On board the M/S RICHMOND 9 you will find the finest Turkish dishes, prepared using the freshest vegetables, fish and meats. Our cook is an expert in his field. He will pamper you with three meals a day: breakfast, lunch and a three-course dinner in the evening. If you have any special dietary requirements (if there are certain foods you dislike or mustn't eat), simply let him know. He will be able to prepare dishes to suit your exact taste. Meals are mailny served on deck under the awning which protects you from the sun. In cooler months, our guests dine in the deck salon. Your meals on board: Fullboard (3 meals + teatime) price € 28,- p/person per day. (the food for the crew is included in this). Soft Drinks and alcoholic drinks are extra, you may send us a list and we can buy them at supermarket prices and you just pay us the bill plus a service-extra for the crew of only 10%: We think that's a fair offer and all previous guests did appreciate that very much. There is nearly none of the gullet charter-companies who tells you the truth about the use of air-conditition on Gulets. Yes, M/S RICHMOND 9 has AC and you switch it on indivually. But on a boat the AC can only run when the generator is on, or in a harbor when connectet to 220 Volt. Mainly you are in anchorbays, often next to a neighbor, who doesn't like the noise of your generator and you wouldn't like it either during the night for example. In Private Gulet Charters, gulet is rented privately. There is no fixed itinerary and it is possible to board or leave the yacht in any harbour, such as Bodrum, Marmaris, Göcek or Fethiye. Prices change depending on duration and the month. masks, flippers, canoe, windsurf, sun awnings, sun mattresses, deck chairs, sea ladder, TV, music system, CD-Player. 5 air-conditioned cabins (2 master cabin, 3 dbl + single bedded cabin), all cabins have shower/wc and hot water, hair dryer, saloon, fully equipped galley, indoor/outdoor dining, crew quarter. And of course, like all our boats, the M/S RICHMOND 9 meets international safety regulations including life jackets, fire extinguishers and alarms.